Available for take home or in-office whitening, Captivate by Nupro is a great option to achieve your whitest smile yet! 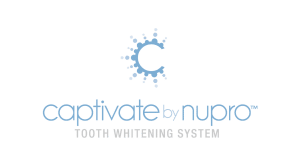 Captivate by NUPRO Tooth Whitening System delivers dramatic results – up to 6 shades whiter when used alone and 9 shades whiter when used in combination with Hydrogen Peroxide patient take-home kits. Results are fast, 15 minute treatments (up to 45 minutes) with a contrasting gingival dam and whitening gel to help ensure protection and uniform coverage. Our friendly dentists provide a take-home teeth whitening treatment so you can lighten the shade of your smile comfortably at home. Call us today at Houston Dental of Columbus and Manchester to schedule an appointment with Dr. Hosuton to learn more about teeth whitening. We look forward to revitalizing your smile!